It is almost four years since the nation was delivered pension freedoms – giving savers greater control over their hard-won retirement pots. Although welcome, many people are still wrestling with the rules of their new-found emancipation. The changes began in April 2015 and gave people greater flexibility over what to do with their funds on (and before) retirement. Savers with personal pensions could suddenly take as much money as they wished out of their plans at any time from age 55. They were also permitted for the first time to bequeath their pension to their family – free of inheritance tax. The freedoms have proved popular, with £23.6 billion cashed in by the end of 2018 – though few blew their cash on Lamborghinis as the architect of the reforms, Steve Webb, then Pension Minister, joked that they might. But with freedom has come responsibility – a serious dose of it. Savers now require more nous about how to make their pots last a lifetime. Financial advisers can offer help but research by insurer Canada Life suggests about seven out of ten of those who access their funds do it without expert guidance. The upshot is that flexible access leaves many savers vulnerable to making bad decisions, such as cashing in too much, making poor investment choices – or running out of money. Worse still, they have become easier targets for either fraudsters or unscrupulous advisers eager to part them from their retirement fund. Fiona Tait, technical director of specialist adviser Intelligent Pensions, says: ‘Flexibility can be useful but the reality is that you can only spend the money once, and if you use it early you could be left with little to live on later in retirement. Unless you have an urgent use for the money, it is better to leave it in the pension so that it can continue to grow in a tax-efficient environment. Tait says: ‘Will the cash improve your overall financial situation? Perhaps you can use some of it to pay off debts, which would free up those loan repayments.’ But if the plan is to blow the lot on one holiday, then it is best to think again. The generous tax treatment of a pension fund – especially for those who wish to pass it down the generations – means savers who need cash are usually better off cashing in other investments first. Tax-efficient Isas, shares or cash deposits should be the first port of call. Working out how to convert a pension pot into lifetime income is ‘the nastiest, hardest problem in finance’, according to renowned American economist William Sharpe. Adrian Boulding, chief innovation officer at financial company Spire Platform Solutions, says the best starting point is to work out what you will need in terms of essential income, lifestyle income and any legacy you want to leave behind. At the same time, factor in the years that lie ahead. Jonathan Watts-Lay, of adviser Wealth at Work, says: ‘Most people live longer than they expect. For help on what income to aim for without it running out try an online calculator such as offered by the Money Advice Service at moneyadviceservice.org.uk. 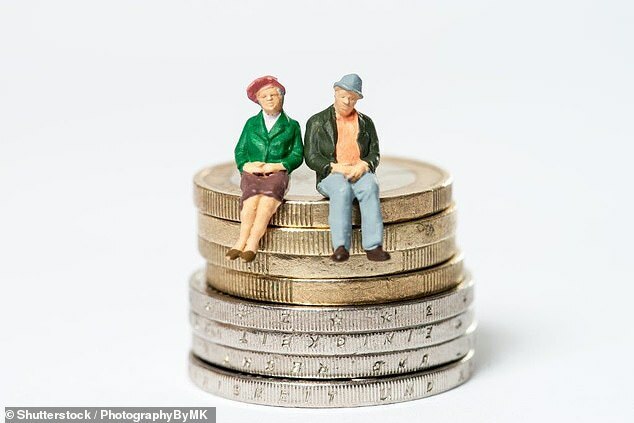 Before pension freedom, the majority of people purchased annuities with their entire pot at retirement – after taking 25 per cent tax-free cash. But in the last decade these deals have proved poor value – and once purchased they cannot be unravelled. Boulding says buying an annuity to cover necessities can be sensible if the remaining pension is left invested, with withdrawals made as and when required. As the years pass and guaranteed income needs increase in importance, more of the pot can be converted into an annuity. Boulding calls this ‘salami slicing’. People cashing in their pots often divert the windfall into a bank account as a safe home for their money. Tait warns that unless you have plans to spend this, a bank account is a poor value option. The pension is best left to run. Tom Selby, senior analyst at broker AJ Bell, says investors who opt to leave their pensions invested while drawing an income ‘face a great balancing act’. Those who took this course in April 2015 and chose their investments carefully have done well so far in ‘generating a golden combination of income and capital preservation’ because of strong stockmarket returns. The broker found that pension freedom customers often chose investment trusts that pay strong dividends to achieve this goal. For example, someone with a pension fund of £100,000 who took a £5,000 annual income did best with investment fund Fundsmith Equity – with the pot now worth a healthy £165,000. Savers should consider financial advice before making any decision with their pension – even if it means paying hundreds of pounds. Find a regulated professional at findanadviser.org. Willy-nilly withdrawal of cash from a pension can cost a fortune in unwanted tax. It can be more sensible to take small regular amounts from a pension, topping them up with sums taken from an Isa as these withdrawals are tax-free. A saver who has already started taking benefits under the freedom rules, but then wants to start topping up the pot again should be aware the maximum annual allowance for contributions falls from £40,000 to £4,000. Breach the limit and there is a tax penalty. Defined benefit schemes are dubbed the creme de la creme of workplace pensions because they are based on a combination of salary and length of service and guarantee an income for life, whatever the weather on the stock market. But thousands of scheme members have been transferring out of these gold-plated plans into personal pensions to gain greater access to their savings. A transfer involves giving up pension scheme benefits in return for a cash value which is then invested in a personal pension. This can in turn be cashed in, converted into an annuity, have an income taken from it as and when – or left alone to be passed down to the next generation. Some of the cash values offered in the last two years have been hard to resist – up to £1 million or more for the lucky few. Watts-Lay says: ‘Regulated financial advice must be sought to transfer a pension if its value is £30,000 or above. But there is no requirement to take ongoing advice once the transfer has been made. People invest with all sorts of goals in mind: paying for their kids’ college tuition, getting together the down payment for a house, achieving wealth or financial independence. But topping that list is no doubt building a nest egg they can live on in retirement. For purposes like the first two, the “spending” math in some respects can be relatively simple. But when it comes to your retirement portfolio, it’s not. The key question is this: How much of your assets can you safely withdraw and spend each year and still feel secure about not going broke before you go? And among the more well-known answers, first promulgated by financial advisor Bill Bengen, is 4%. But just because it’s a popular answer doesn’t mean it’s always the right one. For this Motley Fool Answers episode, co-hosts Alison Southwick and Robert Brokamp have invited retirement finance expert Dr. Wade Pfau to talk about the pros and cons of the 4% rule, as well as five key assumptions that Bengen made when he calculated it — and why they don’t always apply. But first, it’s a “What’s Up, Allison?” segment about one of the lesser-discussed aspects of the college admissions bribery scandal: Those parents were committing crimes on behalf of kids who are unlikely to get any more benefit from going to an elite, prestigious school than they’d have gotten from University of Pick-a-State or Generic Mid-Tier Liberal Arts College. Alison Southwick: This is Motley Fool Answers. I’m Alison Southwick and I’m joined, as always, by Robert Brokamp, personal finance expert here at The Motley Fool. Southwick: In this week’s episode, Bro interviews personal finance expert Wade Pfau on Bro’s favorite topic. Brokamp: That’s right — the 4% safe withdrawal rate. All right! Southwick: And I’m going to talk about whether getting into a prestigious college really matters. All that and more on this week’s episode of Motley Fool Answers. Brokamp: So, Alison, what’s up? Southwick: Well, Bro, you’ve probably heard, but on Tuesday last week 50 people in six states were accused by the Justice Department of taking part in what could be the biggest college admissions scandal eveeer! Southwick: Here we go! Essentially 33 parents were charged with paying anywhere from a few thousand dollars to upwards of $6 million to get their kids accepted into fancy schools. They paid off coaches. They paid off people who help their kids cheat on their SATs and ACTs, and from The New York Times, we have a quote. Are you ready? Boom! He totally practiced that in front of the mirror. So the typical and legal way to get your kids path to college paved in gold is to pay a lot of money for SATs prep. Get some coaches for your kids so they can be a recruited athlete. Big donations to the school of choice. Did you know that parents pay upwards of half-a-billion dollars a year to independent education consultants? Brokamp: Oh, my God! Well, I’ve seen the prices, so I know. Southwick: Well, you paid money to an education consultant. Brokamp: Only recently. Not for our first kid, but for the second kid. Southwick: It’s crazy! So anyway, you’re part of a trend. Southwick: So it’s always a little more interesting when celebrities are involved. Those include Lori Loughlin from Full House. Also Hallmark television movies, I’m sure. She allegedly arranged with her husband, the designer Mossimo… Remember those clothes from the ’90s? Brokamp: Yes, she was on Desperate Housewives. Southwick: She made a “charitable donation” of $15,000 to have a proctor change her daughter’s answers on the SATs. Southwick: Her husband, but he didn’t get indicted. She’s the one who’s getting pulled in. Brokamp: But he was in the courtroom for her bail hearing, which is like $250,000. Southwick: Wow! So, all of this racketeering and fraud was done thanks to the hard work of William Singer. He’s the founder of the college prep business called Edge College & Career Network, also known as The Key. CBS News said that he’s helped over 800 parents, so I think we are just at the tip of the iceberg of the people who are going to get arrested. Most of his work was around gaming the SATs and ACTs, such as claiming the kids had disabilities, which then gave him more time to bribe administrators and bring in his own proctor who would doctor the students’ answers. He also used the money to grease the palms of recruiters and coaches. He lied about students’ ethnicities to take advantage of affirmative action programs, and he even went so far as to Photoshop the kids’ faces onto actual student athletes so that they could get recruited. Oh, I don’t know how it works. So, all this money is flying around to get kids into the best colleges, but does it really matter? Well, let me go ahead and crib an article by Derrick Dawson in The Atlantic. Southwick: There’s a study for that. Back in 1999, Stacy Berg Dale and Alan Krueger decided to look into the “Harvard Effect.” If you go to Harvard are you going to be more successful? By which, of course, we mean richer. They found out that if two kids have the same SAT scores and apply to the same colleges, but one goes to Harvard and the other doesn’t, they can still expect to earn the same income throughout their careers. They called this finding The Spielberg Model because the famed movie producer applied to USC and UCLA, but got rejected, so he attended Cal State Long Beach. Isn’t that nice? Brokamp: Well, there you go. Southwick: That study was 20 years ago. Let’s fast forward to 2018 where researchers at Virginia Tech, UVA, and Tulane decided to revisit the study and dig a little deeper and look at gender. They found out, as did the Dale and Krueger study, that if you’re looking at two similar men, then their outcomes will be the same regardless of where they went to school. However, if you’re a woman it’s a different story. They found that attending a school with a 100-point higher average SAT score increases a woman’s probability of advanced degree attainment by 5% and earnings by 14% while reducing their likelihood of marriage by 4%. Also, among married women, if you went to a better college, your spouse will more likely be highly educated as well. Women who graduate from elite schools delay marriage, delay having kids, and stay in the workforce longer than similar women who graduate from less selective schools; therefore, they make more money. So it’s not necessarily that they make a different wage. It’s just that they work more. What about minorities and those with lower income? Krueger and Dale, from the original study that we talked about, found that income gains from attending an elite college are highest for students from a disadvantaged background. And a 2017 study by Raj Chetty looked into educational mobility between the generations and found that if you’re from a low-income family and you go to an elite school, that gives you a much higher chance of becoming a top earner probably because, he thinks, you get the “network effect,” which means you’re hanging out with wealthier people, and their network, and their alumni, and the professors, and they’re providing connections and a signaling effect that helps them go farther. And the last study I’ll mention comes from Eric Eide and Michael Hilmer of BYU and San Diego State University, respectively. They decided to look at majors and see if that matters when it comes to whether you go to a prestigious school or not. And they found that for business and other liberal arts majors, school prestige does matter, but for fields like science, technology, engineering, and math, expected earnings turn out the same whether you went to prestigious schools, expensive, or low-priced schools. They think it’s because STEM fields are relatively standardized in what you need to learn, but also apparently STEM degrees often come with a large amount of debt. They cited an article in their Wall Street Journal piece that if you go to the University of Pennsylvania instead of Texas A&M, the average starting salary would only differ by less than $1,000, but the tuition difference would be over $167,000. So, at that slightly higher salary, you’d have to work for more than 150 years before you’d make up for the vast tuition difference. As for the degrees where it does matter — business, education, humanities — again, the researchers think it’s because in those fields it’s about who you know, the peer network, the faculty connections, and the alumni, and that really gives you the boost when you go to a prestigious college. The bottom line is the news for affluent parents — who are flipping out over whether their kids are going to get into good schools — is that it’s more important for your kids to develop good habits and be hard-working than it is to get into a super prestigious school. Most of the articles [indicate] that if you’re a parent trying to get your kid into a prestigious school, you’re just doing that for your own ego. You’re not really doing that for the benefit of your kid. So bringing it back to the recent college admission scandal, [to] be quotable Andrew E. Lelling, United States attorney for the District of Massachusetts said, “The real victims in this case are hard-working students,” who were displaced in the admissions process by “far less qualified students and their families who simply bought their way in.” And that, Bro, is what’s up. Brokamp: Chances are if you read articles or books about personal finance, or have listened to this podcast for a while, you’ve heard of the so-called 4% rule. That’s supposedly the amount that retirees can safely withdraw from their portfolios each year and be reasonably assured that their money will last as long as they do. But where does that rule come from and is 4% the right safe withdrawal rate for you? Here to help us answer those questions is Dr. Wade Pfau, who is the host of the blog at RetirementResearcher.com, a professor at the American College of Financial Services, the director of retirement research at McLean Asset Management, and the author of many articles, studies, and books including How Much Can I Spend in Retirement? A Guide to Investment-Based Retirement Income Strategies. Wade, welcome to Motley Fool Answers! Wade Pfau: Thanks, Robert! It’s a pleasure to be here! Brokamp: Let’s start by introducing the 4% rule just so people understand the basics. Its origins can be traced to a 1994 article published in the Journal of Financial Planning by Bill Bengen, who was then a financial planner in California, and here’s how it works. So, in the first year of retirement you withdraw 4% of your portfolio. In subsequent years, you adjust that dollar amount for inflation. For example, if you have $500,000 on the day you retire, you would withdraw 4%, or $20,000. The following year, you’d adjust it for inflation, so if inflation was 3% over the previous 12 months, you would then withdraw $20,600 at the beginning of the second year. So, that 4% just comes at that first year. It’s not 4% every year, at least as originally conceived. Now since Bill Bengen’s 1994 article, there’s been an avalanche of research about withdrawal rates, including additional research by Bengen himself. Some of it has confirmed 4%. Some say 4% is too low. Some say 4% is too high. And I’d say one of the main reasons the different studies come to different conclusions is because they use different assumptions, so I thought we’d go through five key assumptions underlining Bengen’s original study and we’ll have you, Wade, weigh in on whether they’re valid nowadays and how they ultimately affect the amount that people can safely spend. Sounds good? Pfau: Yes, it sounds great! Brokamp: Let’s start with assumption No. 1, a portfolio that is a mix of 50% to 75% large-cap U.S. stocks — nowadays represented by the S&P 500 — and five-year government bonds. When Bengen did his original study, it was just those two asset classes and he came to a conclusion that 50%-75% stock allocation was around ideal. Does that hold up based on your research? What does research indicate is the optimal mix of stocks and bonds for a retiree? Pfau: That whole line of research where you’re going to rely on an investment portfolio for retirement. If you just want to use bonds, you can figure out exactly how much you can spend over a given time horizon by just looking at the bond yield curve, and as soon as you want to start spending more than that — which today with interest rates being so low the 4% rule can’t really be supported by bonds — what happens is you quickly get pushed to a high stock allocation. I’ve even looked at this issue with global returns data for 20 different countries and I think 18 of the 20 countries showed the highest worst-case withdrawal rate for a stock allocation of at least 50% or more. So, if you’re going to rely on investments for retirement, you’ve got to get pretty aggressive with your stock allocation. Brokamp: Does having a more diversified portfolio help? I know subsequent research that Bengen did included small caps. Other studies have included international stocks. Does that have any benefit to a retiree? Pfau: It can, definitely. The small-cap piece… Bill Bengen did a follow-up article a couple of years later where he had a very heavy allocation of small caps, much more than their market-weighted portion, and then he found the withdrawal rate increased to 4.5%. And the issue is you have all these different asset classes and assumptions you might make about the returns or the volatilities of those asset classes. I wrote an article that was published in 2012 where I created a framework where people could choose whatever asset classes they want and then decide on the returns, volatilities, and correlations between them all, and be able to calculate a withdrawal rate from that. And certainly it’s the case that anything that could either increase the return, of course, or just reduce the overall portfolio volatility through the things not being perfectly correlated can help to increase the withdrawal rate. Brokamp: What about the non-stock portion? Are five-year Treasuries the best choice? Pfau: Yes, that was the sweet spot in Bengen’s analysis. In that data set from Morningstar, they have 30-day Treasury bills, the intermediate-term government bonds — which are about five years — the long-term government bonds, and then a long-term corporate bond index. As you go to those greater maturities you get a higher average return, but the volatility starts to pick up. In his analysis — and I agree with it — the five-year intermediate-term government bonds were the sweet spot for higher returns than Treasury bills, but not such a big boost to their volatility, so they did support the highest overall withdrawal rates. Brokamp: Once or twice in our show I’ve referenced your work that indicates that maybe even annuities would be a better choice than bonds in some situations. We might get to annuities later in the show. Generally speaking, are annuities a good replacement for bonds? Pfau: Yes, that’s something I’ve written about. The 4% rule lives in an investments-only kind of mind-set where you don’t consider annuities. But, absolutely, at the end of the day, bonds are the least efficient way to support a retirement spending goal. [With] annuities — if you’re talking about a simple income annuity — the insurance company is investing that money in a bond portfolio so you get bond-like returns plus you get the power of risk pooling where, if you end up living longer than average, you receive these subsidies from the risk pool to help support your spending, and so stocks and annuities work a lot more effectively for a retirement income than stocks and bonds. Brokamp: And, as you point out, when we’re talking about annuities, we’re generally talking about immediate-income annuities, not necessarily variable annuities, although they can with some living benefits. Correct? Pfau: Yes, the story for other types of variable or indexed annuities is if you add the optional income guarantee rider, they can work in the same sort of way as an income annuity. They may have a smaller guaranteed payout rate, but they give you the liquidity for the assets and some upside potential. You’ve got to look on a case-by-case basis. Not all of them are priced competitively, but the good ones are reasonably competitive with income annuities, as well. Brokamp: Let’s move on to assumption No. 2 and that is the past performance of U.S. investment markets are indicative of future results. When you look back over the 20th century, even as far back as 1900, the U.S. was a great place to invest. The last time I checked, I think only Australia and South Africa had better returns since 1900. You’ve written about whether it might be too optimistic to assume that the returns we’ve seen over the last 100-plus years are what we’re going to see in the future. Pfau: Yes, the 20th century U.S. is really unique in world history, and even though there were things like the Great Depression, the remarkable thing about U.S. market returns is even when there was a big drop, it quickly recovered. That happened with the financial crisis in 2008 as well, where there was a major stock market drop but it quickly recovered. Now, you don’t always see that in other countries. The first study I did, when I got into this retirement planning space, was with this global returns data from Morningstar for the 20 different countries. I just looked at whether the 4% rule worked with other countries’ data, and it was just in the U.S. and Canada that it worked. It didn’t work in the other 18 countries for any number of different reasons. But I think if you’re then trying to develop assumptions about what’s reasonable for a forward-looking retirement today, you might draw from what was a more typical international experience. And in that data, the 4% rule worked 68% of the time instead of 100% of the time, like in the U.S.
Brokamp: And that’s the stock side, right? The other side is cash and bonds. We’re in a situation now where interest rates are still pretty historically low despite the Fed raising rates since 2015. Pfau: Yes, so then going from that international experience, I started looking more at different aspects of the U.S. markets, and, yes, interest rates are on the low side, historically. They were low like this in the 1940s. The 4% rule survived the 1940s, but for a diversified portfolio that was after the Great Depression and stock market valuations were also quite low. Then before the Great Depression, stock market valuations were high like they are today, but interest rates were quite a bit higher and there was a deflation. The price level dropped 25% during the Great Depression. So, [with] these studies about inflation-adjusted spending, the value of bonds in real terms doubled during the Great Depression and bonds came to the rescue of stocks. So, today, when we have low interest rates and high stock valuations at the same time, it’s not clear what can come to the rescue of the other, and both of those are suggestive of lower bond returns potentially. And there’s no controversy about the bonds, but there is more controversy about stock valuations and potentially lower stock returns, and both of those will then feed into lower and sustainable spending rates. Brokamp: I think that’s important to emphasize. High valuations in the stock market tend to be followed by low returns, but it’s no guarantee. But when you start off with low interest rates, the return you’re going to get from bonds is going to be pretty low. Pfau: Yes, there’s a very close relationship between today’s bond yield and then the subsequent return from bonds. Brokamp: Let’s move on to assumption No. 3, and that is retirees earn the index’s returns. So when you look at the studies of safe withdrawal rates, they’re using historical returns for something like the S&P 500, or the EAFE if you’re using international stocks. Basically, it’s assuming that the retiree earns the index’s returns. But perhaps you can talk a little bit about the impact of fees, underperformance, and taxes on safe withdrawal rates. Pfau: In this regard, Bill Bengen was doing a very valuable contribution, because the whole point of writing that article about the 4% rule was to explain this idea that if you say the stock market earns 7% on average after inflation, it doesn’t mean that you plug 7% into a spreadsheet, and then it looks like 7% is a safe withdrawal rate with 100% stocks, because every year your portfolio grows 7% and you take 7% out. The 4% rule is picking up the volatility of the reality that if you’re taking distributions after market downturns, that can hurt the sustainable spending rate. So, he made a lot of simplifying assumptions and one of those was — in explaining why 4% is more realistic than 7% — just assume investors earn the historical index returns from these various stock and bond indices. Now to the extent that investors don’t earn those historical returns, either because there are expense ratios on their mutual funds, or they’re not rebalancing every year right when they’re supposed to, to the aggressive 50%-75% stock allocation, or they don’t have the 50% stock allocation in the first place, or any number of issues, there; quickly the 4% rule goes away if you take a haircut off of the historical returns to account for those sorts of features. It’s not a one-to-one relationship, but if you take the historical data and just assumed investors earned 1% less each year than whatever the market earned, then the 4% rule comes down to be about a 3.5% rule. Brokamp: The real takeaway here is that whether you are managing your own investments or hiring a financial advisor to do it, you’ve got to pay attention to fees and you’ve got to pay attention to performance, because it really can impact either how much you could safely spend each year or how long your portfolio lasts. Pfau: Yes, the 4% rule works historically, but there are an awful lot of historical points that were just slightly above 4%, and so it’s kind of right on the edge of the cliff. Just a small haircut in market performance blows away the 4% rule, so you’ve got to be careful with that. Brokamp: Let’s move on to assumption No. 4 and that is retirees need a steady stream of inflation-adjusted income. The study assumes that the income that the retiree needs goes up every year to account for the cost of living and it intuitively makes sense. If prices are going up, then retirees will need more income every year. But over the last decade or so, I would say, there’s been more research taking a look at the real-life spending of retirees and some of it is finding that actually expenses go down over the course of retirement, or at least don’t go up as much as inflation. What’s your take on that? Do retirees need to adjust their income every year for inflation? Pfau: Yes. So far, we’ve mostly been talking about reasons where if you use a more realistic assumption, then 4% may be too aggressive. But this is a reason why you might use more than 4%, and it’s just that your spending doesn’t grow with inflation and that certainly is a typical retiree’s case. There’s this idea of the go-go, slow-go, and no-go years where just as you age you’re doing less traveling, you’re going out to restaurants less frequently, and so forth. And your spending other than health expenses is likely not keeping pace with inflation. And if you build in the assumption that your spending doesn’t grow with inflation, naturally you can spend at a higher rate early in retirement because you’re not having to take the full inflation adjustments. For a typical person, it probably is pretty reasonable to assume that their overall spending needs are not going to grow with the Consumer Price Index throughout their retirement. Brokamp: I think I read that generally speaking — and again this is general and I’m just going from memory here — that if you have an analysis that assumes a 4% safe withdrawal rate and that based on you needing your spending to adjust to inflation, if instead you account for what seems to be the real-life spending of retirees, closer to 5% is safe or, alternatively, you can retire sooner because you need about 15%-20% less saved before you retire. Does that sound about right? Pfau: Yes. One of the articles in this area was David Blanchett’s Retirement Spending Smile, where he talks about how your expenses decline until the very end-stages of retirement. That’s why it’s a smile shape, here. Your expenses start coming back up. But I ran just with the historical data where, if you assume inflation-adjusted spending, it’s a 4% withdrawal rate. With his spending pattern, it was a 5.5% withdrawal rate. So, yes, that’s the impact that you’re referring to. Brokamp: To a certain degree it does depend on your situation. I could see if you retired with a mortgage, for example. That’s clearly an expense that will go away at some point down the road. Another reason I know why expenses drop is because many people enter retirement as a couple, but unfortunately someone passes away, and when that happens, expenses drop somewhere around 20%-30%. So, is it a safe assumption, do you think, that your spending will go down or do you think it actually builds in a margin of safety that maybe you should just assume your expenses will go up? Pfau: Well, I’m comfortable with assuming the inflation-adjusted spending has that margin of safety. One of the big banks did a study of all their clients that have credit cards and banks with them and identified different types of retirement spenders, so you can figure out your own situation. The only category they found where you should really anticipate your spending growing with inflation was what they called “the globetrotters,” which were wealthier individuals who tended to do a lot more traveling in retirement. Otherwise, most of the other group saw their spending decline relative to inflation. So you can figure out whether you might have something unique that would cause you to need your spending to grow with inflation, but otherwise you might just decide you can anticipate less spending with age and go in that direction, as well. Brokamp: So, that’s the inflation part of it. The other part is the “steady” part. A good deal of the research — and you cover a lot of it in your book — is choosing some sort of variable spending strategy, where the amount you spend each year depends on some sort of factor. Probably the biggest one is the performance of your portfolio from the previous year, so maybe if your portfolio is down, you don’t take the inflation adjustment, or you don’t take out as much. Some other strategies factor in some actuarial type of data. Factoring in, maybe, your life expectancy. It seems to me like that’s where most of the research is going. What’s your take on variable spending strategies? Pfau: I talk about there being four different ways to manage sequence risk and now we’re moving into the second way. The first was just spend less. Figure out how low your spending needs to go so you don’t run out of money. But the second way is adjust your spending in response to market performance. That can really help to manage sequence risk. If the markets go down, or if your portfolio is losing value, if you cut your spending, you’re less exposed to sequence risk because you’re not having to sell more shares to meet your spending goal. You’re keeping it in line. You clarified at the beginning how the 4% rule is just about your first year of retirement. Sometimes people confuse the 4% rule to say that each year you take 4% of whatever’s left in your portfolio. In that kind of strategy, that’s a variable spending strategy. It’s an extreme one, but it doesn’t actually create sequence risk because your spending is always adjusting to the market. You’re always taking the same percentage of whatever’s left which means you might reduce your spending quite a bit. And so most of the variable spending research is trying to balance between these two extremes where you cut spending, sometimes, but you don’t want to cut spending too dramatically, or you want to kind of pace yourself. There’s just different rules around what should trigger a reduction to your spending. Or alternatively, as markets are doing well, what would trigger an increase in your spending later in retirement as well? Brokamp: That’s an important point, too, because some people point out that the 4% safe withdrawal rate is basically superty-duperty safe. I think Bill Bengen, as well as Michael Kitces, have pointed out that something like 96% of the historical periods; if you start retirement with a 4% safe withdrawal rate, you’re going to die with at least the same amount of money you had when you started, though not adjusted for inflation. So part of the variable spending is actually allowing yourself to take out more money if your portfolio performs well. Pfau: Yes, the 4% rule is calibrated to the worst-case 30-year period in U.S. data, so in any other 30-year period you have money left after 30 years. And in nominal terms, in 96% of the cases you still have your initial balance. In inflation-adjusted terms, it’s about half of the cases where you would still have your initial retirement assets adjusted for inflation after 30 years. That’s the mechanism whereby some people talk about starting with a lower spending rate but then increase your spending over time if you’re not in that worst-case scenario. Now, that kind of flies in the face of what we were talking about before, which is people tend to want to reduce their spending over time rather than increase their spending over time. But that’s where that approach comes from. Four percent is meant to be conservative. It may not be conservative enough, but it’s meant to be conservative. If you don’t get a really bad sequence of market returns in your early retirement, with the 4% rule you’re probably going to have quite a bit left at the end of retirement. Brokamp: You’ve mentioned sequence risk a couple of times here, and just so everyone knows, it’s basically the sequence of returns: what you earn this year, what you earn this year, and what you earn in the following year. And it’s particularly important those first few years. In your book, you wrote that the returns the retiree receives in the first year of retirement explains almost 14% of the final outcome. Pfau: Yes, it’s the same idea that if you’re planning on a 30-year retirement, the cumulative market performance in the first 10 years explains 80% of the final outcome. What happens later in retirement doesn’t really matter. And we even see that in the historical data. The 4% rule was triggered by the market returns from 1966 to 1995. Now the best-case scenario in history was the 30 years from 1982 to 2011. You could have used almost a 10% withdrawal rate. The markets did really great after 1982. That’s the second half of the worst-case scenario’s retirement, but that’s the idea; that even though markets did great after 1982, that 1966 retirees already decimated their portfolio[s] to such an extent that they don’t get to benefit from that overall market recovery that comes later. Brokamp: And I think a lot of people are surprised to hear that 1966 was the worst. They might think that the Great Depression was worse, but 1966 was also the beginning of a stream of very high inflation, whereas, as you mentioned earlier, the Depression at least had deflation, so that while your portfolio was dropping, you also didn’t need to spend as much. Pfau: Yes, if you were using 100% stocks for the Great Depression, the 4% rule doesn’t work, but with a balanced portfolio, and if you assume you would reduce your spending by 25% since there was deflation instead of inflation, then the 4% rule survived the Great Depression. Brokamp: Let’s move on to our last assumption, assumption No. 5. Retirees will live until their mid-90s. This was sort of implicit in Bengen’s first article. He concluded that anyone who was going to retire between the ages of 60 and 65 should probably assume a 30-year retirement, and many studies have also suggested that people should assume that they’ll live to their 90s. I think most financial planners would agree with that. However, the truth is most people won’t make it that long, so how should people factor life expectancy into their retirement plan? Pfau: Well, part of that is it’s meant to be conservative, but for the types of people that will be listening to this to have a longer-term focus and are thinking about retirement, even the age of 95 is not really so conservative anymore. For people in decent health (non-smokers) — if you have a 65-year-old couple — not for the overall population, but people in decent health who are nonsmokers, there’s about a 45% chance now that at least one of them is still going to be alive at age 95. It’s about 30% for women and about 20%-22% or so for men. So, it’s not so conservative to just only plan to age 95 anymore. Increasingly people might be thinking about if they’re 65, a 35- or 40-year retirement. And if they’re part of the retire-early community, then the 4% rule gets thrown out the window because we may be talking about a 50- or 60-year retirement. The longer the retirement, the less you can spend to make sure that you don’t outlive that asset base. Brokamp: You mentioned people listening to this podcast should assume they’ll live longer. I think what you mean by that is first of all, people who consume any sort of personal finance information generally tend to be higher educated and have higher wealth, and those are both things that are correlated with longer life expectancies. Pfau: Right. More education. Higher incomes. Greater wealth. Probably just generally taking a little bit better care of their health. And this is all relative to the average. People might not view themselves as having higher wealth than average, but when you talk about average 401(k) balances in the neighborhood of $10,000, probably a lot of the listeners are going to be above average in that regard. It’s all correlated, then, with longer life spans. It’s not that every single person’s going to live longer because, unfortunately, there are still accidents or illnesses, but the average person listening to this is going to have a significantly longer expected lifespan than the average overall American. Brokamp: Let’s get back, then, to annuities. When you’re talking about life expectancy in your book — and we’ve talked about this in a previous episode where we interviewed Larry Swedroe — annuities not only mitigate longevity risk, but also the risk of cognitive decline, whereas we get to a point where we’re not necessarily on top of our game, anymore, and we’re more prone to make financial mistakes. Pfau: Yes, it’s a simple set-it-and-forget-it type approach. It pools the longevity risk because it starts to pay you more if you live longer, which is when you need the money because your retirement’s becoming more expensive and you need it. Then it’s there and you don’t have to rebalance your investment account. Stay the course in the face of market volatility. As you become older, you’re more exposed to fraud and theft, and this could be particularly the case if one person in the household is making most of the financial decisions. If that person is incapacitated or dies, that makes the remaining household members particularly vulnerable. You can still skim off of somebody’s annuity monthly check, but it’s going to be a slower and less devastating process than having all of those investment assets exposed to that type of predator in those situations. There’s a professor at Harvard, David Laibson, that calls the simple income annuity dementia insurance. It’s really providing you the protection that your finances are not going to be exposed and vulnerable in the event of developing these types of issues later in retirement. Brokamp: So, let’s get to the bottom line. Those are the five assumptions. Let’s say I’m listening to this. I’m either retired or a few years from being so. How should I go about choosing the optimal withdrawal rate for me? Pfau: It’s a great question! The approach I’ve developed to try to help people answer that I call the “retirement CARE analysis.” It’s just a bunch of factors to consider. There’s other reasons why you can use higher withdrawal rates as well, and those relate to your risk capacity and how vulnerable your lifestyle is to a market downturn. If you can mostly live off of Social Security and if you had a traditional company pension or you’ve bought some annuity, it might not matter if the stock market dropped because your living expenses are covered elsewhere. And that can let you be more aggressive and being aggressive means you could use a higher withdrawal rate or you could use a higher stock allocation or any combination of the two. It’s all about your capacities, your aspirations, what you want to spend, what your legacy goals are, the realities around market return expectations, and then your emotional comfort with different strategies. That’s the “CARE” part of it. And in thinking through that process, there’s no one-size-fits-all answer, but it’s a process that’s meant to help you think through how to choose an asset allocation and a withdrawal rate for your investment portfolio in retirement. Brokamp: Our final question. Wade, you’re one of the nation’s preeminent retirement experts. How much thought have you put into your own retirement plan? What does retirement look like for Wade Pfau? Pfau: It’s a good question. I’m really thinking of it more in terms of financial independence, because I don’t know exactly when I’ll decide to stop working. You don’t necessarily have to stop earning any money if you’re retired or if you’re doing things that you like, but I think of it, right now at least, more in terms of achieving financial independence and then having the flexibility to decide if and when, or where, or whatever around different work-related activities. But beyond that, just having more opportunity to travel, which then is also a function of when you have kids in school you’re kind of limited on the vacation times and so forth. So, both financial independence and having children grow up is creating more flexibility for travel. That’s mostly how I’m thinking about it at this stage. Brokamp: Well, again, our guest today has been Dr. Wade Pfau, the author of How Much Can I Spend in Retirement? To learn more from Wade, visit his website, RetirementResearcher.com. Wade, thanks for joining us! Pfau: Thank you! It’s been a pleasure! Southwick: Well, that’s the show. It’s edited undeservedly by Rick Engdahl [throwback to the top of the show]. Our email is Answers@Fool.com. You can also follow us on Twitter, but I don’t know. Maybe don’t bother. What else do we want to say? For Robert Brokamp, I’m Alison Southwick. Stay Foolish, everybody! Sometimes it can be difficult to figure out the best way to make your monthly paycheck go the distance, yet when you’re trying to mindfully manage your money this is one of the most important questions you an ask yourself. As a personal financial coach, I’ve seen that many of my clients have trouble divvying these up so that they end each month in the black (on budget) and not in the red (ouch, overbudget). The key to paychecks: Do the hard thing first. You’ve probably heard productivity experts suggest that the key to success is “eating the frog” each morning, which essentially means doing the hardest thing on your to-do list first to get it off your plate and help the rest of your day progress more smoothly. Well that doesn’t apply just to your to-do list; it can also apply to your wallet. We’ve all been there: You get your paycheck (cha-ching!) and all of a sudden, your spending trigger finger gets itchy. “First round of kombucha is on me!” or “Tickets to Tulum, finally!”…right? I’m not saying to make these things off-limits entirely, but starting the month off with them isn’t the best idea. In the end, it means you’re more likely to dip into your savings to make sure you can cover your monthly bills. So when you get your paycheck, start by eating the frog. That means pay your bills first. This will give you a better idea of what you can actually afford and what you can’t. Plus, it will ensure that you’re not going to submit a late payment (or miss a payment), which will help keep your credit score from being dinged. It sounds obvious, but many people don’t do it! The best way to stay on top of it is to set up automatic monthly payments from a deposit account. It adds discipline to the process without you having to think about it. From there, think of the 70-30 rule. These bills play into the 70 percent of your monthly paycheck that should be going toward your “essentials”—all those living expenses, such as your mortgage/rent, utilities, insurance, food, and other literal needs (soap! toilet paper!). I also recommend putting 5 percent of this pool into your emergency fund each month, in case your car dies or laptop refuses to start. Then, break it down further into 15-15. Fifteen percent of your paycheck should be going to your “endgame,” aka things for your future like savings accounts, investment accounts, and retirement accounts. Don’t frame it as a burden to have a 15 percent “bill” every month. Think of the endgame as being the lovely stuff you get down the line from this 15 percent. I promise you that “future you” will thank “present you” for it. Now comes the fun part, because building some wiggle room into your budget is a must if you want to stay on track. Allowing yourself indulgences here is essential to keeping your budget on track so that you don’t get “money hangry” and end up splurging on something that’ll leave your wallet hurting. The remaining 15 percent of that monthly paycheck is for the “extras,” meaning, whatever does it for you. First round on you at happy hour? That comes outta this 15 percent. Those concert tickets you’ve been eyeing? That also comes out of this 15 percent. You can spend this money freely and confidently, knowing that you’re not dipping into any other categories to drum it up. By doing the hard thing first and paying your bills before you start spending on additional shopping, dining out, or entertainment, you’re ensuring that bills are paid on time, and you’re not dipping into your savings to make sure your insurance premium is paid. Money market unit trusts have become popular as they appear to provide a safe, secure and reliable haven for your investments. During times with extreme volatility, you may be comforted knowing that your hard-earned rands will earn interest, as you put your money in and you get it back with a sliver more. But, no investment is risk free, so the question is – are money market funds right for you, now? “Many investors have flocked to the safe havens of money market and income funds due to South African equities delivering lean pickings over recent periods,” explains Earl van Zyl, head of product development at Allan Gray. “But the reality is that investing 100% of your assets in rand-based money market funds may not be right for you, especially if you are investing for a long-term goal like retirement or for your child’s education,” cautions van Zyl, adding that money market funds are not entirely risk free. He adds that one of the benefits of money market funds is that your money is easy to access. They are more liquid than a fixed-deposit account with a bank, and don’t hit you with penalties that often apply when you request access to your money from a fixed deposit. Van Zyl cautions that it is a misconception that money market funds are risk free. Investors in money market funds are exposed to a number of risks, which can result in real (and, in extreme situations, even nominal) capital losses. The three major risks include negative real interest rates, credit risk and liquidity risk. The second reason investors may not want to invest in a money market is credit risk. Money market funds invest in debt instruments. If the issuer of the debt instrument goes bankrupt, investors would likely bear a loss. Some funds, such as the Allan Gray Money Market Fund, try and buffer against this risk through diversification of issuers. While the risks apply mostly to extreme circumstances, such as the financial crisis of 2008, van Zyl says it is important to be aware that money market funds, like all investments, are not entirely without risk. “If you are worried about the risks of the money market fund you are considering, ask your investment manager how the fund is positioned to deal with them, and what the plan is to protect investors’ capital. “As always when making a big investment decision regarding your money, consider speaking to an independent financial adviser who can help you make the right decision for your goals and risk appetite,” concludes van Zyl.